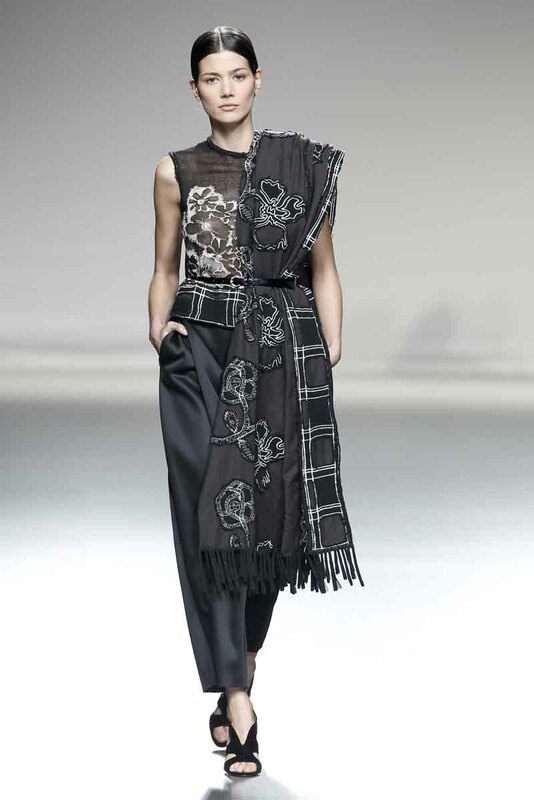 On Sunday, February 16, 2014, at the Feria de Madrid, Ana Gonzalez unveiled the Victorio & Lucchino Fall 2014 collection during Mercedes-Benz Fashion Week Madrid. Our work presents some important changes with regard to volume and form. Our woman of today, as indicated by the name of the collection, seeks a series of different silhouettes, different ideas that do not simply hug the body, but adorn it with a fresh and renewed approach. Designs are reinvented in order to usher in a new oversize movement. The predominant colour is black, which combines tentatively with touches of grey, beige, green and brown. A floral reference coexists with a rigid pinstripe appeal, making an appearance in evening-wear and blending with the brilliant shine of lurex. The fabrics: technological, pinstripes, piqué, velvet, jacquard, cold wool, neoprene, embroidered gazar, georgette, crêpe and fil-coupé. The colours: black, brown, green and grey.